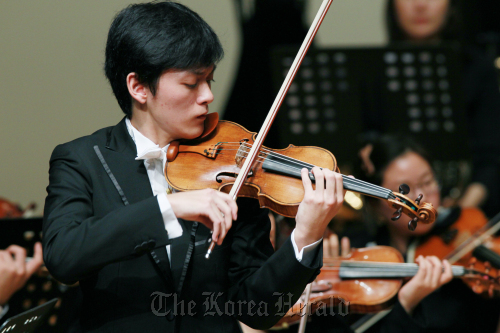 Taiwanese violinist Yu Chien Tseng has topped the 2011 Isang Yun Competition, the Tongyeong International Music Festival Foundation said on Monday. In the final competition in the violin category this year held on Saturday, Tseng performed Brahms Violin Concerto with the TIMF Ensemble, led by Adriel Kim. Despite her young age, the 17-year-old’s academic but seasoned performance not only put him at the top of the competition, but won him the Isang Yun Special Prize, which is given to a musician who best interprets the Korean composer’s piece, the festival organizer said. Tseng, who studies at the Curtis Institute of Music, received $30,000 in prize money. The second prize went to Korean student Cho Jin-joo from the Cleveland Institute of Music in the U.S., followed by another Korean, Kim Young-uk from Hochschule fur Musik Munchen in Germany. The fourth prize winner was U.S. musician Nigel Armstrong from the Colburn School and the fifth, Korea’s Lee Ji-yoon from the Korea National University of Arts. The Isang Yun Competition is held annually, with three different categories ― cello, piano and violin.